Would it surprise you if I told you that I grew up struggling with body image? Probably not. And that’s incredibly sad. The number of young girls, women, and yes, men too, that struggle with negative body image is staggering. We all feel the pressure to be look a certain way, and we all feel like we’re not good enough if we don’t look that way. Those of us with chronic autoimmune disease, that can often affect our appearance face this issue of negative body image… including myself. A negative body image can be incredibly wearing both emotionally and physically, which is why healing my own negative body image was so crucial for healing my own Hashimoto’s and for healing autoimmune disease in general. So, how do you do it? To tell you the truth, my negative body image began way before I was ever diagnosed with an autoimmune disease. I was never a healthy kid growing up. I was never the “thinnest”, the most athletic, or the most stylish. I was frequently ill and little did I know, it was only foreshadowing for more illness to come as I got older. I’d compare myself to the other kids who were thin and healthy and desperately wanted to be like them. Why couldn’t I? Was I just doomed to be self conscious forever? By the time I was diagnosed with Hashimoto’s disease at 17, I had already been through over a decade of hating my body… how it looked, how I felt in it, how it made me feel. This diagnosis of Hashimoto’s disease meant that I would have a chronic disease for the rest of my life that affected my appearance, mood and energy. As my weight became unstable and digestive issues worsened, I began restricting calories and over exercising which only ever resulted in more hatred towards my body. I would obsess over how my appearance changed one day to the other, constantly turning to the side in front of mirrors to see if my tummy was protruding a millimeter more than it was yesterday. It became so maddening, that I eventually resorted to turning the lights off in front of every mirror. Something had to change. Not only did I have to heal my body, but I had to heal my heart. So, how can autoimmune disease create negative body image? In a body conscious world, changes or differences in our physical appearance can negatively affect our body image. However, how we see our bodies doesn’t have to be all physical appearance. Rather, how we perceive our bodies can be influenced by how well they function. Autoimmune disease often results in some sort of impaired function. Whether it be fatigue, joint pain, headaches, mood shifts, or more, we can so often view our bodies as bad or to be working against us which also contributes to how we view our body in general. What are the affects of negative body image on autoimmune disease? Though the physical manifestation of symptoms may indeed be physical, body image is all mental. It’s our negative self-talk when we put on a top that we see as unflattering. It’s the voice in the back of our head saying that our hair looks terrible. It’s the compulsive urge to restrict food an overexercise to shed the unwanted weight. Sound familiar? Me too. And it’s made my autoimmune disease worse when I was this hard on myself. In the words of Buddah himself, “We become what we think”. Our thoughts and perception of ourselves have a powerful impact on how we feel on a daily basis, and how our autoimmune disease progresses. If we perceive our situation as a bad and our body as bad, that becomes our reality. With autoimmune disease being caused by our body attack itself, the last thing we need is our mind to be attacking itself. Beyond perception, having a negative body image is physically stressful to the body. When I would cry and get worked up about how I looked due to weight gain in college, I was influencing a chronic stress response which caused high cortisol. Cortisol is a stress hormone that is woven in with the intricate web of our other hormones. If we’re over producing cortisol, our hormones become out of balance, which harms our ability to heal. Having a negative body image does nothing than exasperate an already unideal situation of autoimmune disease. So what do we do? 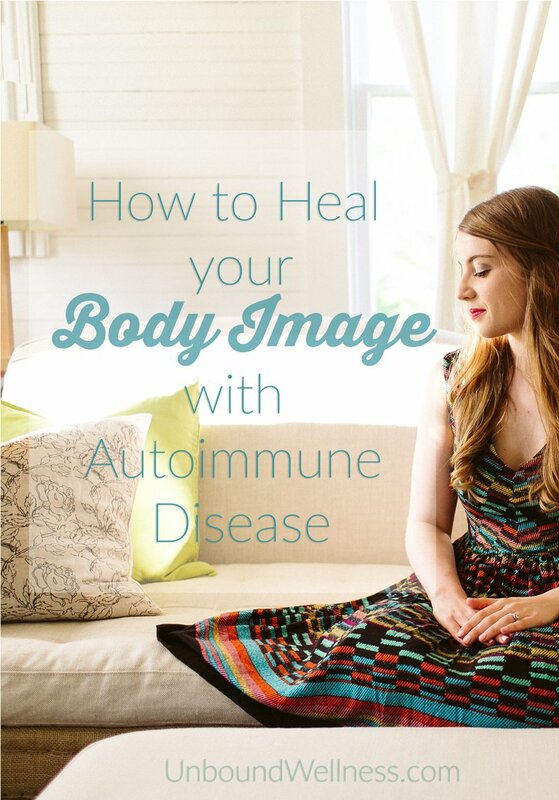 How to Heal and have a Positive Body Image with Autoimmune Disease. 1. Focus on your health not your appearance. Society leads us to believe that our appearance is directly connected to our health. Society got it wrong. When we ditch the idea that we have to look a certain way, or weigh a certain amount to be healthy, we do our bodies an incredible favor and make huge strides in our body image healing. Becoming bound to believing that heal is behind a door that is represented by a certain body is wrong and harmful. Focus on your health as a whole. That means mental, physical and emotional health.… how much energy do you have? How much did you laugh today? How stressed do you feel? Are you moving your body in a way that you love? Are you enjoying real food that you love? Your health is so much more than your physical appearance. 2. Nourish your body with whole foods that you love. A negative body image is often coupled with a strained relationship with food (much more on that later). My own negative body image was married to a bowl of special K cereal with low-fat milk. Food was calories to me, and my negative body image controlled that. Loving your body is synonymous with treating it well and doing things that enable it to feel better. Special K did not make me feel good nor did calorie restriction. When we nourish our bodies with real food, we give both our body and our mind what it needs to help us feel our best. But really, why does what we eat matter for our mental health? We are made-up of millions of cells that are made up of the cholesterol that we consume. Eat fat! Our hormones that influence our mood are made from the proteins that we choose. Eat humanely raised, wild caught, and local! Energy and vitality is fueled by rich vitamins and glucose found in fruits and vegetables. Eat your greens, reds, purples, blues, and anything that was grown on this Earth! Now, a nourishing diet is different to everyone. Just because I love bone broth in the morning doesn’t mean that you will. My best advice as a nutritional therapy practitioner is to eat what your body wants that is properly raised, properly prepared, properly portioned, and eaten with gratitude. 3. Meditate, pray, and journal. Practicing mindfulness is a game changer in both healing autoimmune disease and having a positive body image. When we really get down the core of hating our bodies and becoming honest with ourselves, we can more easily uncover the truth that our body is not our enemy. However, that realization takes time, self reflection, and hard conversations with yourself that are often best had with journaling, or observed through prayer and meditation. Though restorative yoga has helped me getting closer to mastering mediation, prayer just can’t be replaced for me. Bringing my problems and concerns to God not only help with perspective, but with overall healing. 4. Practice self-care and positive self-talk. That nagging voice always telling you everything that’s holding you back from loving yourself. So much of negative body image can be incredibly internalized and often fueled by negative self talk and poor self-care. Think sleepless nights followed by a constant mental soundtrack telling yourself that you look tired and gross. Been there, done that. Turning that negative self talk and lack of self care around allows you to start taking control of how you see your body and how you feel in it. Luckily practicing self-care and positive self-talk is one of the most indulgent and enjoyable parts of this process. Where can you start? Tell yourself that you love yourself… that you’re worthy of love, and that you’re worthy healing. Enjoy hobbies that you love and may have recently neglected. Take that “me time” that you’ve been depriving yourself of. Practice simple indulgences like hot baths, long walks, and a pedicure or two. Basically… treat yo’ self, and be kind to yo’ self. 5. Focus on more than the exterior. In my post talking about my weight gain with Hashimoto’s, I say that we need to stop measuring people’s character by their outward appearance. This not only goes for how you see others, but how you see yourself. You are so much more than your body, and so much more than what your disease may have done to it. You are God’s creation with a personality, a favorite song, a special talent, a beloved hobby, a past, a future, and so much more. You are at least a thousand things other than just your body, and just your disease. Autoimmune disease is never an ideal situation, I get it. Changes in your body and health can be damaging, and changing your mindset takes time. This process didn’t happen to me over night and it likely won’t for you. However, remember that the process is worth it, and the journey to loving your body is so much richer than a life of hating it.